Love and commitment have enabled Lynda and Ellen Thomas to get through Lynda’s diagnosis and treatment for inflammatory breast cancer (IBC). As Lynda continues her fight, the couple are spreading awareness to other women about the rarest and most aggressive form of breast cancer. Lynda and Ellen live outside Boston with their four children and have become staunch advocates for the IBC cause during Lynda’s ongoing care at Dana-Farber’s Susan F. Smith Center for Women’s Cancers. They reach out to fellow patients and caregivers on social media, appear on local news broadcasts, and even lobbied successfully for Massachusetts to declare a state-wide Inflammatory Breast Cancer Awareness Week the past two Octobers. 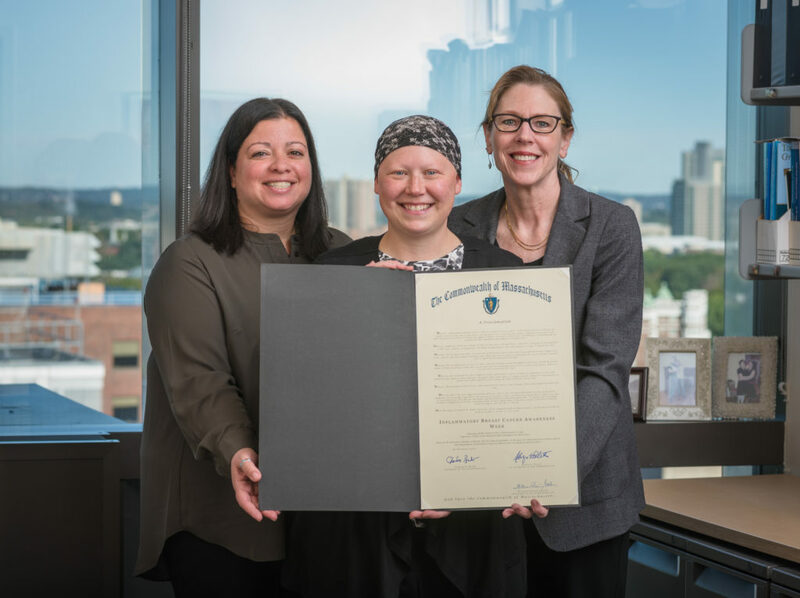 From left to right: Ellen Thomas, Lynda Thomas and Beth Overmoyer, MD, photographed with an official proclamation from the Commonwealth of Massachusetts declaring Oct. 1 – 7, 2017 Inflammatory Breast Cancer Awareness Week. Many women – and even many doctors – are indeed unaware of the sneaky symptoms of IBC, which accounts for two to five percent of all breast cancers annually and strikes younger women much more often. Unlike other breast cancers, which are usually spotted as lumps during self-exams or in routine mammograms, IBC hides under the guise of other conditions. Breasts are enlarged, red, sore, tender, or warm to the touch – symptoms more commonly associated with infections. These warning signs come quickly, and worsen rapidly, as Lynda discovered. In the winter of 2016, discoloration and swelling led Lynda to a doctor, who – thinking she had an infection – prescribed antibiotics. When these only caused more complications, the then-39-year-old was sent for mammograms and ultrasounds that were also unable to detect the malignancy. By the time a biopsy finally revealed her IBC diagnosis two months later, it was a stage 3 cancer – meaning it was locally advanced. According to Beth Overmoyer, MD, director of the Inflammatory Breast Cancer Program at Dana-Farber, mammograms and ultrasounds are often unreliable with IBC, which almost always presents as either stage 3 (locally advanced) or stage 4 – by which point it has metastasized to other parts of the body. Another challenge is that IBC is more resistant to chemotherapy. Lumpectomies, often an option with other breast cancers, are not so here because of IBC’s nature of spreading throughout the entire breast, including the skin. During Lynda’s extensive treatment – chemotherapy through a clinical trial, a mastectomy, and then radiation — Ellen was by her side. Lynda took almost no time off from work, and the couple juggled childcare duties with a devoted group of friends. Parents of four young children, Lynda and Ellen Thomas want to make sure other young moms – and all women – know the warning signs of inflammatory breast cancer. Now Lynda and Ellen are both back to work, together – they are colleagues at a local healthcare system. Lynda visits Dana-Farber every three months as part of another clinical trial. Overmoyer lauds the couple for their devotion to each other and others, and knows they will be at Dana-Farber’s second annual IBC Awareness Patient Forum in May – where Overmoyer plans to update attendees on progress of a clinical trial developed at Dana-Farber and now being offered to IBC patients at five cancer centers throughout the country.